From choosing the most effective seat material, to the correct mounting considerations of an actuator, Dixon can advise on such factors which can affect the wear and tear on a valve and in turn create problems with contamination and reduce a valve’s life cycle. 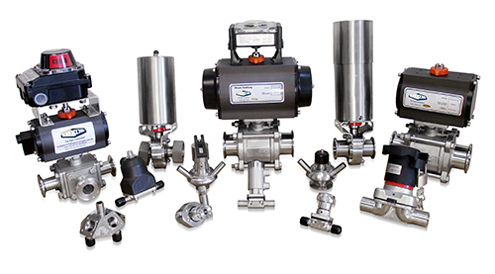 Dixon’s entire range of high quality ball and butterfly valves can be actuated to customer specification with a range of stocked accessories that includes limit switches, solenoids and positioners. All actuators have been type-tested to 1,000,000 cycles. Full technical and sales support is available from their qualified technical sales team to ensure specification of the most suitable valve for your process. Dixon offers same day and next day delivery on most standard actuated valves and custom fabrications subject to customer requirements. With on-site actuation shop, 3D design, full technical and sales back-up, and BSI approved manufacturing and engineering departments, Dixon can design and produce individual bespoke valves and fabricated configurations to quickly and efficiently solve customer problems.